Rachel is a writer and academic. 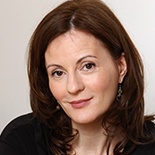 She lived in Russia for over a decade and is now an affiliated lecturer in Slavonic Studies at Cambridge University, and a Fellow of Murray Edwards College. Her Molotov’s Magic Lantern was published by Farrar, Straus and Giroux in the US and was shortlisted for the LA Times History Prize in 2011. It is a book of travel, history and memoir that conjures a sense of Russia’s history and how its fault lines reappear in modern life. Faber published in 2010 to rave reviews, and it won the Dolman Travel Book Prize in 2011. It has been published in several languages, and was shortlisted for the Prix Medicis in France. The Italian edition won the Italian Citta delle Rose Prize in 2015.